They were trying to protect American jobs from global trade. In 1930, Congress slapped tariffs on all countries that shipped goods to America in an effort to shield U.S. workers. 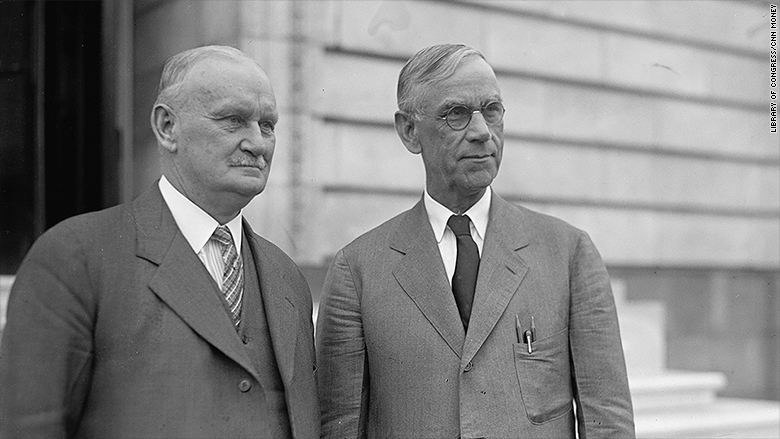 It was called the Smoot-Hawley Act, named after two Republicans Congressman, Reed Smoot and Willis Hawley. And it is widely accepted that it made the Great Depression worse than it would have been. "Smoot-Hawley really demonstrated what a bad idea tariff increases are," said Alan Deardorff, a trade expert at the University of Michigan. To get the law passed, Congressmen had to support each others' tariffs. If one needed a tariff to protect textile workers, another needed a tariff to protect farmers. It snowballed, resulting in hundreds of tariffs. Tariffs for imported eggs went from 8 cents to 10 cents a dozen. Onions rose from 1 cent to 2.5 cents. Sugar, peas and wheat rose too. Those might sound small but this was 1930 after all, and the increases infuriated other nations. European countries, such as Spain, Italy and Switzerland, retaliated with tariffs of their own, and a trade war began. Willis Hawley and Reed Smoot. The biggest retaliation came from Canada. Gobsmacked that the U.S. raised tariffs on eggs, Canada raised tariffs on U.S. eggs to 10 cents from 3 cents. Here's how that worked out: U.S. exports of eggs to Canada fell to about 7,900 dozen in 1932 from 919,000 dozen in 1929. "It sounds easy that we block imports and create jobs here but we forget about what other countries can do to us," says Doug Irwin, an economics professor at Dartmouth and author of "Peddling Protectionism: Smoot-Hawley and the Great Depression." In total, the volume of U.S. imports fell 40% in the two years following Smoot-Hawley, which became law in June 1930. Donald Trump talks a lot about imposing tariffs on Mexico and China. Critics say, "Remember Smoot-Hawley." 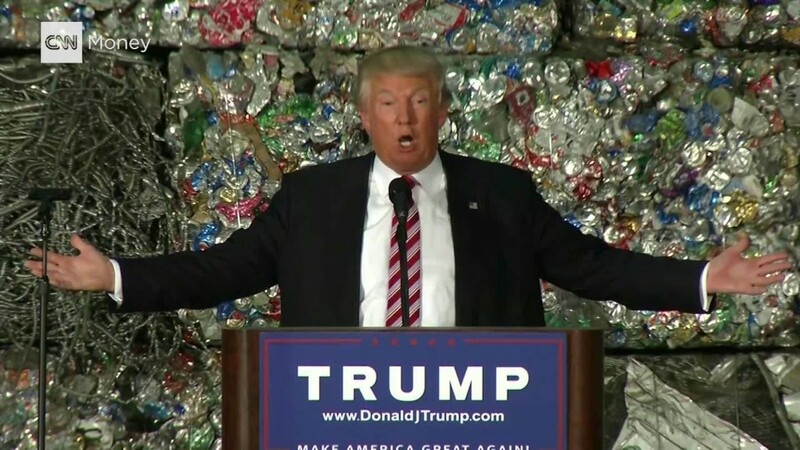 Proponents say Trump's trade proposals and Smoot-Hawley are not the same thing. "There are no similarities at all," says Peter Navarro, a business professor at UC-Irvine and an adviser to Trump. "The only similarity is the word 'tariff' there are no other similarities." There are important differences. Trump wants to raise tariffs on Mexico and China. Smoot-Hawley raised tariffs on everyone. Navarro says Smoot-Hawley was a "protectionist" tariff and "an unfair trade practice." Trump wants to do a "defensive" tariff. Navarro says there are far more similarities between what Trump wants and how Ronald Reagan approached trade. In the 1980s, Reagan targeted semiconductors and motorcycles from Japan after Japan violated a trade agreement. The move was largely considered successful. Japan started to play by the rules. Not so fast, say Irwin and Deardorff. The key similarity between Trump's proposed hardball tactics and Smoot-Hawley is the potential for a trade war. "If China and Mexico retaliate against the United States, that would be similar to Smoot-Hawley," says Irwin. Navarro acknowledged that China could retaliate. But he also notes that China would lose the lucrative U.S. market. Another similarity is that both would fail to protect, or bring back, American jobs. "If we raise tariffs on China, a lot of those jobs would go to countries in southeast Asia," says Deardorff. Again, Navarro disagrees. He points out that American workers have the highest productivity in the world. That should lure jobs back to the U.S., he argues. However, technology has eliminated many manufacturing jobs. Getting tough on China, while needed and worthwhile, won't bring jobs back that were lost to technology, experts say. During Smoot-Hawley, the World Trade Organization, a symbol of free trade, didn't exist. Trump is a fierce critic of the WTO because China is a member. But one person who supported the creation of the WTO is Trump's idol: Ronald Reagan.